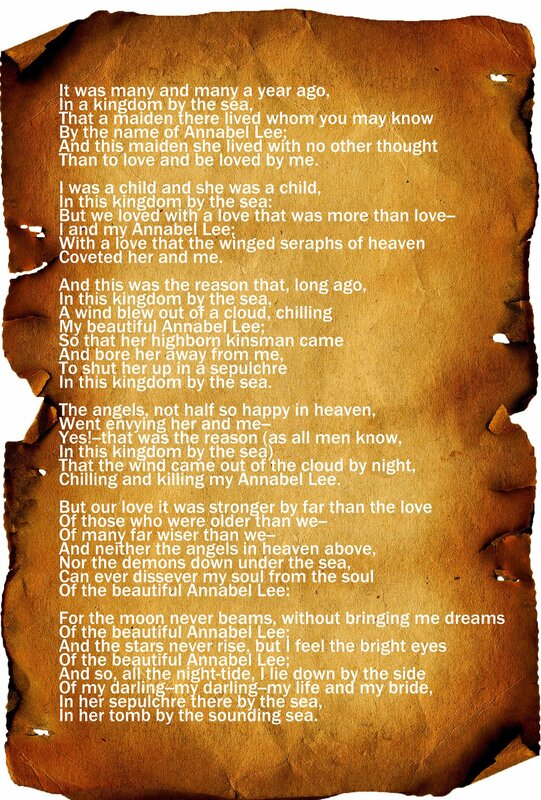 “Annabel Lee” poem is often called the anthem of love and death. Indeed, in some ways this work echoes Petrarch’s lyrics dedicated to Laura. However, unlike Petrarch, Edgar Poe considers death as something insignificant. In any case, the author truly believes that the death is not a good reason to part the lovers. And this poem hides many images of the Victorian era which is famous for its special attitude to life and death. Technically, “Annabel Lee” is composed as a song with repeating “chorus“, but we can also consider this work as a spell designed to break the wall between living lover and dead Annabel. The author refuses to accept the idea of ​​death so much, that he uses this word only once throughout the entire poem. However, once mentioned, this word completely changes the meaning of this love anthem. It completely changes the created image of Annabelle herself and her lover as well. The lover, who continues to share his bed with her beautiful Annabelle, although in fact this bed is the tomb. “It was many and many a year ago, In a kingdom by the sea” – we hear this introduction and prepare to hear a fairytale. Indeed, everything begins as a fairytale. The first strophe of the poem speaks of magic which we simply call love. Well, the absolute majority of people really experience the period of falling in love is as a time of magic. At the same time, the image of the sea with a magical kingdom on its shore permeates the whole poem and becomes the most repetitive image. Talking about love, the author repeats “In this kingdom by the sea“, as if this repetition is able to return the time of his fairytale love. And if the first part of the poem describes the sea as a fabulous one, later it becomes threatening. Moreover, later we even find out that there are “demons down under the sea“. However, these discoveries will be made later, as we move further into the author’s imaginative world. Surprisingly, the poem has virtually no description of the main character. She is the only reason why the author became a creator, but we still know nothing about Annabel’s appearance and her other features. The strophe “I was a child and she was a child,” gives us a description of their youth, but this is not enough to imagine the image of charming Annabel fully enough. However, it is quite obvious that the author emphasizes not her physical perfection, but his own love for her. And it is also obvious that his love is clearly not only romantic and platonic, but also quite physical. So physical that the bodies of two young lovers seem to be tied by an invisible thread. And it is exactly this indivisibility that leads to a dramatic ending. When the author writes “But we loved with a love that was more than love“, the reader understands how important this period was for the author. It was so important that he simply does not notice the changes that have occurred with his lover. The poem introduces the enviers – “With a love that the winged seraphs of heaven Coveted her and me.” By the way, the use of the word “coveted” as coming from the heavenly spirits already hints at some bad ending. Because it was the wind that cooled beautiful Annabelle, turning her from hot and sensual girl into cold, dead body. Only in line 26, for the first and last time, the author mentions the word “killing”. It is as if the absence of this word will allow him to make a physical death incomplete, to abolish it. The poem has one more analogy with classical literary characters. This is the mention of a man who tried to part the author from the body of his beautiful Annabel. This person is described as a “highborn kinsman“. That is, not simply “kinsman”, but “highborn kinsman”. It is quite obvious that this is how the author emphasizes the difference in social status of two lovers. Perhaps this difference did not let young people consolidate their love officially. Perhaps, this difference did not allow them to hope for a joint burial. The attempt to part lovers frightens him, and the author finds the only solution he sees reasonable. “I lie down by the side In her sepulcher there by the sea.” He still takes his place – the place of a lover – on the bed of his beloved one. And for him, it does not matter at all that this bed is a crypt. Now his bed is her sepulcher.